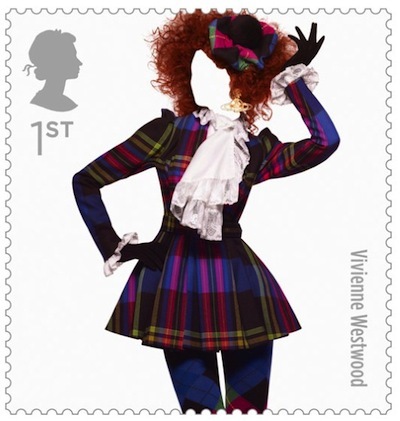 Dame Vivienne Westwood, we salute you! And we're claiming her as one of our own since she was born in Tintwistle in 1941, at that time within the county borders of Cheshire. And it's Vivienne's birthday on 8th April - two jolly good reasons to dedicate our April fair to her. An innovative, complicated and profusely creative designer, Vivienne Westwood combines a deep reverence for high culture, history and reading lots of books with a sharp irreverence for authority and dull conformity. 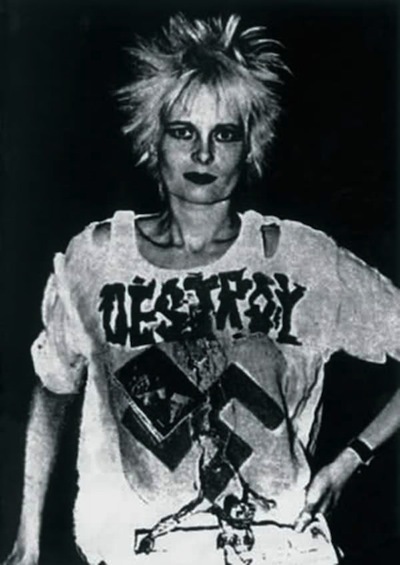 In 16 short years she went from conspicuous thorn in the side of the establishment, with her partner Malcolm McLaren, to gleefully receiving an OBE from the Queen in 1992 - famously sans knickers - later upgraded to DBE in 2006. "You have a more interesting life if you wear impressive clothes." "Britishness is just a way of putting things together and a certain don't care attitude about clothes. You don't care, you just do it and it looks great." "What I'm always trying to say to the consumer is: buy less, choose well, make it last." "The young need discipline and a full bookcase." "I disagree with everything I used to say." Our suggested dress code for this fair is Westwood pieces if you are lucky enough to have any! Otherwise, we'd love to see some tartan, Harris tweed, sheepskin, sharp tailoring, punk styles, and, most of all, ingenious and artfully careless combinations of any of the above. Make Dame Vivienne proud with your heroically original ensembles! There's also . . . This 1990 documentary "features interviews with Westwood, McLaren, Terence Conran, Peter York and various others. It is a career-spanning retrospective that follows Westwood’s extraordinary story from the little village in Cheshire where she was born, down to London and through the turbulence and confrontation of the punk era, right up to the moment where her designs, perhaps ironically, grace the walls of an exhibition in a locale synonymous with Britain’s artistic establishment, the Victoria and Albert Museum." UPDATE! : we've just had confirmation that the resident DJ at Peter Hook's Fac 251 nightclub, Señor Jamie El Muerto, will be playing a specially tailored, late 70s - early 80s set of the hippest sounds from that era for your listening and dancing pleasure. Catch him from 12.00 pm to close in our Food Court at the front of the Market Hall. Even fashion folk get hungry - although they like to pretend they don't - and we've got that covered in fine style too. Revive yourself with an award-winning gourmet hot pie from Lord of the Pies (update! Menu just in, see below) and please give a warm welcome to VV newcomers Honest Crust, who promise to serve us "hand crafted sourdough pizzas made using the finest local and Italian ingredients all baked in 90 seconds in our mobile wood fired oven." Provisional Menu, may be subject to change depending on availability of ingredients. Kandoo Mobile Coffee will be on hand with their top quality espresso-based beverages, and it wouldn't be The Vintage Village without Stuart Thornley Cake Design providing something sweet and delightful for afters. Here's his menu just in! Tell us you're coming along on Facebook and feel free to invite all your friends too! All Mod Cons - vintage mid-century homeware, telephones, collectables, ladies' accessories 50s-70s. Now installed at Room at the Top Vintage Goods. NEW! Agatha Blue - vintage furniture and homeware. All Our Yesterdays - vintage homeware, collectables, toys, tins and much more. Anne Langton - handmade bead jewellery; vintage items. Amy's Closet - vintage jewellery and accessories. Baboushka's Silver - superb quality vintage silver jewellery from the 1880s to the 1980s. Black Cat Vintage - vintage clothing and homeware. Blue Cat Jewellery - vintage jewellery, glassware and ceramics. Bottle Green Vintage - women's vintage clothing and accessories, 1960s-80s. Caroline Syddall - vintage costume jewellery and accessories, homeware. Cyprys Vintage & Collectables - vintage clothing, kitchenalia and collectables. Eclecta Books - books, magazines, paper ephemera, photographs, vinyl. Find them at Room at the Top Vintage Goods. Eclectique Chic - vintage women's clothing 50s-80s, costume jewellery, homeware. They're having a HUGE sale to make way for new stock, so don't miss out! NEW! Emily Pickle - Own design retro style tea towels, cards and prints; bags, purses, hair clips made from vintage fabric; vintage fabric and china. NEW! Evoke Vintage - vintage homeware, accessories, jewellery, clothing, mostly 1960s-80s. Fiona Barber - vintage clothing, china, jewellery and collectable records 1950s- 80s. Garbo Antiques - an overwhelming choice of vintage men's and women's clothing, accessories, costume jewellery and more. Heirloom Rose - vintage clothing and accessories 40s-80s. HR Collectables - glass, ornaments, pictures, books and more. NEW! Jackal Threads - men's vintage clothing and accessories 1940s-80s. jamessharpart - hand-printed textile collage goods: journals, aprons, bags. James Wilson - vintage homeware, collectables, miniature traction engines. You never know what you will see on James' stall! Je Ne Sais Quoi - vintage homeware and decorative items. NEW! Joanne Charleson - vintage homeware, books, toys. Jodi-Jo-Retro - cushions made from vintage fabrics, tote bags, purses, dollies, vintage knick-knacks, retro cards. Kitsch Republic - vintage, handmade and recycled homeware. Lace & Liquor Vintage - women's vintage clothing, homeware, kitchenalia, collectables 40s-70s. 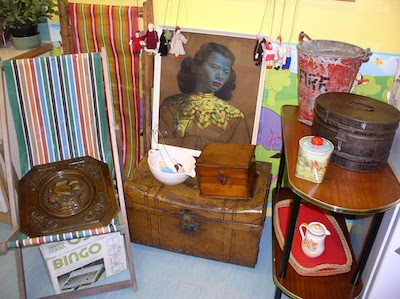 Lady Kitschener - vintage homeware, books and children's stuff. Lonsdale Avenue - vintage homeware, kitchenalia, furniture and ceramics. Maggie Mae's Vintage - vintage homeware, kitchenalia, textiles, luggage, haberdashery, furniture, clothing, accessories, 1920s-60s. Make Do and Mend - small furniture, homeware, collectables, ornaments, and a few clothes. Mint Vintage - women's vintage clothing and accessories 1970s-80s; vintage homeware and kitchenalia 1940s-70s. 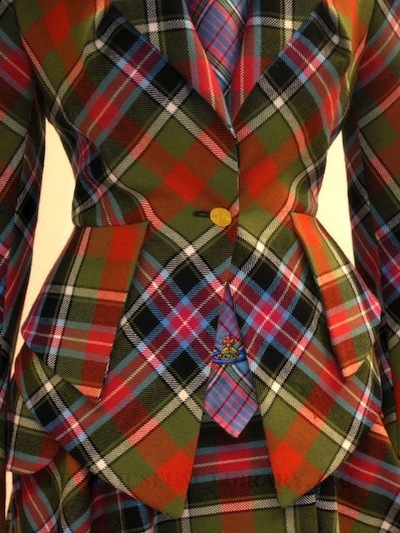 One of a Kind - vintage clothing and accessories for ladies and gents. Oooh Betty! - vintage homeware and camping/summer stuff. NEW! Pearlie Queen Collectables - vintage homeware, ceramics, glassware, costume jewellery 1920s-50s. Penelope Cat Vintage - children's books 1940s-80s; homeware 1930s-70s. Populuxe - vintage homeware, jewellery, collectables. Waiting to welcome you at Room at the Top Vintage Goods. Pretty Nostalgic magazine - everyone's favourite "brilliantly British" magazine, and we're in the latest issue as winners of their Best Antiques & Vintage Market in Britain award! Pick up your copy from regional editor Sam Young at this fair. Purple Jellybaby - handmade dresses, vintage/customised clothing, bags, jewellery. Retrodec - vintage homeware, collectables, coats, hats, jewellery. RetroFunky - vintage homeware, decor, small furniture, lighting, luggage, clothing, record players, clocks, cameras, books, toys, games. retrospektiv studio - mid century vintage furniture, home ware, pictures and objet d'art. From the Anglomania collection, Autumn/Winter 1993-4. Source. 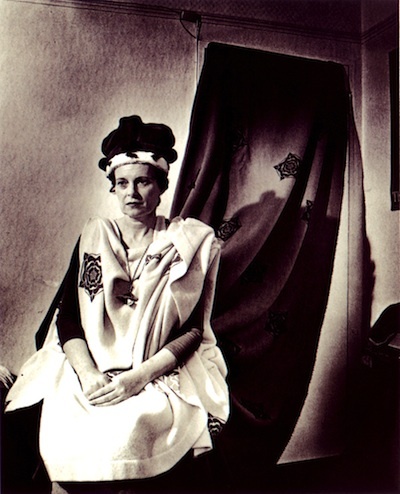 A regal Queen Vivienne, portrait by Alistair Thain. Source. Westwood muse Sarah Stockbridge in a mini-crini from the Spring/Summer 1985 collection. Source. The Buffalo Girls (Nostalgia of Mud) collection, Autumn/Winter 1982-3. Source. A high honour - being immortalised on a stamp! Source. A preview of some of the new stock All Our Yesterdays will be bringing to The Westwood Ho! Fair. NEW! Ring O'Roses Vintage & Collectables - vintage homeware, accessories, collectables and some clothing. Rita Black - vintage homeware, decorative items and collectables. Serendipity - vintage homeware, costume jewellery, handbags, accessories. Shady Lane Vintage - women's vintage clothing and accessories, homeware 1950s-70s. Sheila's Store - lots and lots of vintage jewellery! Show Us Your Threads - women's vintage clothing and accessories, and homeware. Snygg - only the finest mid-century ceramics, glassware, homeware, decor, textiles, and various interestingly-shaped bits and pieces. Stuart Thornley Cake Design- cake supremo, artiste of icing sugar. Details of this month's specials coming soon. Sue Booth Design - vintage jewellery, collectables (ephemera), textiles, glassware. Suzylovesmilo - women's vintage clothing and accessories 1950s-80s; handmade and upcycled accessories, clothes and homeware. NEW! T.E.A. - homeware, kitchenalia and collectables, 1930s-70s. Tea for Two Vintage - vintage homeware, tea sets, vintage clothing for men and women 60s-70s, accessories, bric a brac. The Side Room - vintage clothing, jewellery, accessories, table linen and lots more. Time Bandit - vintage homeware, kitchenalia, toys, clothing, jewellery, small furniture. TinTrunk - vintage apparel for ladies and gents, jewellery, homeware, textiles, collectables, luggage. Find TinTrunk at Room at the Top Vintage Goods. Toast Rack - men's and women's vintage clothing, accessories and jewellery, 1930s-80s. Village Vintage Clothing - men's and women's vintage clothing, accessories and jewellery. Up at Room at the Top Vintage Goods. Vintage Allsorts - vintage clothing, jewellery, homeware, kitchenalia 1950s-60s. Vintage Belle - vintage women's wear, accessories, and some homeware. Vintage Clutter - vintage needlework accessories, lace, fabric, fashion accessories, costume jewellery, homeware, collectables. Vintage Pair - vintage homeware, ceramics and furnishings 1930s-70s. NEW! Watch the Flowers Grow - British flowers presented in imaginatively vintage-themed ways. Punk floristry this month! Wax Delerium - rare vinyl.